He drew them, but they were full of sand and mud. So it happened for a month and more, though now and again he would find a small sea-gudgeon hidden in the mud. His poor wife waited every evemng in the hope that he would bring something home, and despaired every time when it was only a small gudgeon to cook on the gridiron. What could that avail them? They were hungry and had no bread. “Give me thy word, and that will be my business.” He gave his word, thinking, “What does it matter to me what I promise, who have not so much as a puppy dog!” He patched up his nets as well as he could, threw them again, and with that one cast caught a boatload of fish. Having sold them, he went home with his handkerchief full of gold pieces, bought new nets, plenty of bread and meat, wine even, the utmost he could desire. On the following day he cast his new nets, and caught as much fish; and again he gained a handkerchief full of money. Thus it was day after day, and, as the way of the world is, the other fishermen became jealous of him. But soon the fishermen’s wives were jealous too. Months came and months went, the goodwife was full of joy that she was at last to have a child after she had given up all hope of one. But the fisherman was sad. “I can do more than that, for I can let her have it with the froth still upon it.” So the shepherd took him home, and they ate together, and then they slept. While it was still night he milked the skin full, and then said to the youth, “Off with thee, this is thine only business!” The youth set off, and when he had gone a little way, he took out the feather and called “Eagle!” He became an eagle, and in the early morning he arrived with the froth still upon the milk. He became a man again, and went upstairs. When the Princess saw him, she looked at him closely, and was more pleased than I can tell you. Said she, “This is the first time I have seen thee?” “Your shepherd has taken me as his servant, my Princess, to bring the milk to you.” She asked him a great many questions, for he was handsome, and she had taken a fancy to him. The King of the ants pulled out one of his wings and gave it to him, saying, “Take care of it, and whenever thou wilt thou canst become an ant.” He takes it and goes at night to the outside of the palace, cries, “Ant!” and at once he was changed into an ant. The youth crept into a cranny of the palace-wall, and entered the Princess’s chamber. He saw her lying asleep, and at each corner of her bed hung a lighted lamp. He became a man, put out the lamps, went to the Princess and kissed her. “A man pinched me ! ‘ He looks about, but there was nobody, for the youth had again become an ant.” Thou hast been dreaming, my child, and awoke out of thy sleep, and hast spoilt my rest too,” he said grumblingly, and went away. After a little while Yianko again took his own shape, and caressed the Princess. Once more she screamed, and once more Yianko was an ant in the cranny, so that he might not be trod upon. But when they saw her determination, they consented, so as not to lose her love, and married her with great pomp, and many guests were invited to the wedding. Then the shepherd found out where Yianko had been all the day and night that he had been missing. Now, however, he was dressed like a prince, and went out with his wife, and she loved him to distraction. They threw themselves on the foe. Some were wounded, others were killed, and the rest were scattered miserably with their King. And Yianko, on horseback, rode, sword in hand, amid liis lions, and slew scores of them. When the battle was over, Yidnko was about to go and wash in the Sea, which was close by, when his father-in-law called to him, “Where goest thou? Where goest thou?” and prevented him, but gave orders to his men to bring water for him to wash in. Early the next morning they set out for the capital of the foreign King, and found that he had collected his scattered forces to prevent if possible his capital being taken. So the battle began again, and again Yianko lighted the lion’s hair, and the lions fell upon them with Yidnko at their head, and they slew all the enemy, and Yianko killed the King with his own sword. Again he ran, all bloodstained, to the Sea to wash. His father-in-law, overjoyed at the victory, forgot to warn him, and as soon as the youth reached the margin and dipped his hand in the water, the Sea threw herself upon him, and drew him in. His father-in-law waited for him ; but as Yianko did not return he went to the beach in the hope of overtaking and warning him, but saw nothing of him. Then he concluded that the Sea must have taken him ; and he who had been so joyful was consumed with sorrow, because he had lost his son who had been the hero and the victor in the battle; and he returned to the palace full of grief. “That I will,” says she. The Mother of the Sea took the apple, and raised up Yianko erect and free. 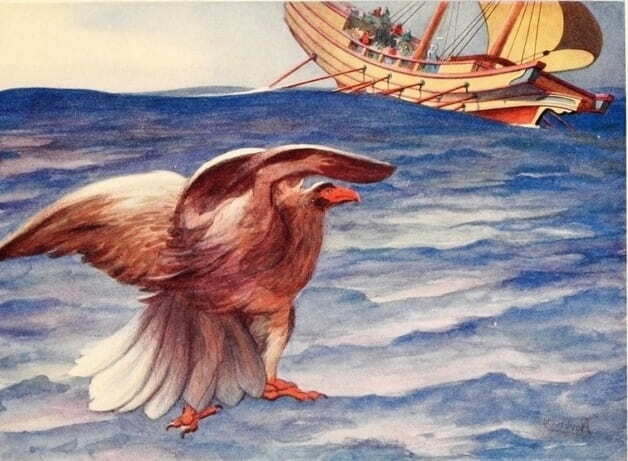 “He cried “Eagle!” and became an eagle, and flew into the ship.” Illustration by Edwin Norbury, published in Greek Wonder Tales by Lucy Mary Jane Garnett (1913), A. and. 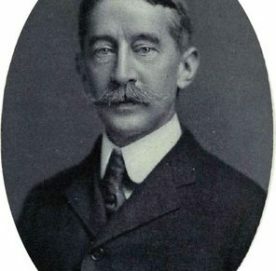 C. Black. When he no longer felt the Sea flowing above him, he cried “Eagle!” and became an eagle, and flew into the ship, and went below to the cabin, and became a man again, and the Princess followed him. A mad wind arose and the waves washed over the vessel ; but he was shut up in the cabin, and the Sea could not get hold of him. Thanks to the worthy captain and the good ship they weathered the storm, and cast anchor and came safely ashore when within an inch of drowning. Then they travelled for two days and nights till they came again to the palace. From this time Yianko remembered never again to go near the Sea. And he became King when his father-in-law died. And the Princess and he lived and grew old, and brought up their children.